EGI's Research eNewsletter Winter 2012: bringing you the latest product and event information. What is the nature of consciousness when a person is in a vegetative state? How much can they hear and understand? What does this tell us about the nature of consciousness? A recently published study in The Lancet used dense array EEG from EGI to demonstrate that some patients, while diagnosed as being in a vegetative state, do understand what they hear and can follow instructions. The vegetative state, defined as "wakefulness without awareness," is conventionally diagnosed using examinations that test for sustained, reproducible, purposeful, or voluntary behavioral responses to various stimuli. However, because these tests are based on behavioral responses, they are not able to detect awareness that cannot be processed into a measurable physical behavior. Recent studies using functional magnetic resonance imaging (fMRI) have shown that some patients, diagnosed as being in a vegetative state, are aware and able to respond to commands, as detected by changes in blood oxygen level in specific parts of the brain. 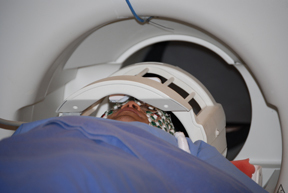 Because it can be difficult and expensive to perform an MRI on such patients, a team of researchers from the University of Western Ontario, University of Cambridge, University and University Hospital of Liège, and Addenbrooke's Hospital in Cambridge performed a similar investigation using dense array EEG, a less expensive and more portable method for measuring brain activity. Read the original research report in The Lancet. | Find out more about EGI’s dense array EEG systems. "Interpretation and Clinical Applications of Dense Array EEG"
"Simultaneous fMRI and dense array (256-channel) EEG"
Electroencephalography (EEG) excels at measuring very fast (millisecond) responses in brain activity. Functional MRI (fMRI) measures the slower (~1 sec) blood oxygen level dependent responses. Using the two simultaneously promises a better understanding of brain activity, based on the two complementary measurements. A recent study from Qingfei Luo and Gary Glover at Stanford University investigated the technical issues of using the two techniques together. They showed that whereas dense array EEG (dEEG) reduces the fMRI signal, it also reduces the noise, resulting in little change to the signal to noise ratio, and thus no significant change to the BOLD signal. Read the original research report. | Find out more about EGI’s MR-compatible EEG systems. EGI's new Net design (originally announced in July 2011) is now available for order in all sizes and channel counts, including for MR environments. The new design provides the same sensor layout and electrode performance as the earlier Nets but has increased mechanical strength that makes it even faster and easier to apply. In addition, new pedestal labels are easier to read, as well as being IR-camera ready for use with EGI's new Geodesic Photogrammetry System (GPS) 2.0. Find out more about EGI's MR-compatible EEG systems. | Request a quote. The Geodesic Photogrammetry System (GPS) is an innovative photographic technology for sensor localization, essential to obtaining the most accurate source estimation with dense array EEG (dEEG). EGI’s new GPS 2.0 features IR cameras to minimize room light distortion, an easy-glide dome movement system for improved convenience, and updated software for user-guided solving of the electrode 3D coordinates as a point cloud. View the syllabus for this course. | Preregistration now open. View the Core dEEG Skills course syllabus.| View the Foundations of Advanced dEEG Analysis Techniques course syllabus. | Preregistration now open. In collaboration with Ann Arbor Rehabilitation Centers and The Center for Neurological and Neurodevelopmental Health (CNNH), Electrical Geodesics, Inc. (EGI) is sponsoring a workshop for neurologists and neuroscientists interested in applying dense array EEG in a clinical setting. Staff from all three centers will be teaching, technical, clinical and business aspects of using dEEG in the clinic. The workshop will be May 18-19, 2012 in Dexter, Michigan, just outside of Ann Arbor. A substantial portion of the course will be devoted to teaching how to record, read, and interpret dEEG, using hands-on techniques and case studies. EGI will sponsor a lunch symposium at the 18th Annual Meeting of the Organization on Human Brain Mapping in Beijing, China. The symposium will be held on Wednesday, 13 June 2012 from 12:30 to 3:30 pm and will be entitled “Simultaneous fMRI and Dense Array (256-channel) EEG: Addressing Practical Challenges and Spatial Resolution". The symposium will feature Professor Gary Glover, PhD from Stanford University School of Medicine. Dr. Glover will present a talk entitled “Optimizing acquisitions and other oddments with EEG/fMRI,” which will cover several topics including: the choice of TR in EPI/Spiral acquisitions, PPG vs ECG for BCG de-noising, MRI Signal dropout with dEEG Net, concurrent M-sequence encoding and inverse solutions, and practical examples in a sleep study on spindles and K complexes. Bookmark EGI's Workshop page and check back for updates. View these and other certificates. Are you interested in an exciting career with EGI? See our Employment page. 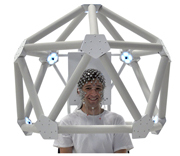 In the third quarter of 2011 over 70 different papers were published using EGI’s Geodesic EEG systems for research. These new publications cover a wide range of advances in neuroscience and medicine including research on Parkinson’s Disease, autism spectrum disorder, social cognition, language comprehension, attention, sleep, anxiety, stress, and more. You may access this Q3 2012 Customer Publication listing here. Or, for a complete listing of EGI customer publications, you may navigate to the link above and download the PDF file available. You can find EGI scientists and staff at the following conferences. Please visit us at our booth to discuss your research and learn about EGI's latest products. See the full conference list.